You'll be £25.00 closer to your next £10.00 credit when you purchase Phantom in the Cold War. What's this? The McDonnell Douglas F4 Phantom was a true multi-role combat aircraft. Introduced into the RAF in 1968, it was employed in ground attack, air reconnaissance and air defence roles. Later, with the arrival of the Jaguar in the early 1970s, it changed over to air defence. In its heyday, it served as Britain’s principal Cold War fighter; there were seven UK-based squadrons plus the Operational Conversion Unit, two Germany-based squadrons and a further Squadron deployed to the Falkland Islands. Phantom in the Cold War focuses predominantly on the aircraft’s role as an air defence fighter, exploring the ways in which it provided the British contribution to the Second Allied Tactical Air Force at RAF Wildenrath, the home of Nos. 19 and 92 Squadrons during the Cold War. As with his previous books, the author, who flew the Phantom operationally, recounts the thrills, challenges and consequences of operating this sometimes temperamental jet at extreme low-level over the West German countryside, preparing for a war which everyone hoped would never happen. As I already knew from David Gledhill, he writes this book in such great detail that it stays interesting and captivating. He uses quotes and all kind of sources, among which, from colleagues, the archive of the British MOD and his own archive. The book contains a lot of good black and white and colour photos on glossy paper. David radiates with his latest book still the passion and dedication for aviation, piloting, but also for the defending of freedom as we know that in West Europe. Brilliant book…even if you have not ever been to RAF Wildenrath! This is a fabulous account of very real Cold War operations at what was the peak of tension into and towards the end of the 1980s. A rare testimony not to be missed. I enjoyed this book and learnt a lot about what it meant to fly the Phantom during the Cold War, and flying from what would have been one of the front line airbases if the Warsaw Pact had made an attack on Western Europe. A superbly interesting account, well written by a former Phantom navigator. This is a splendid read for any Phantom of Cold War jet enthusiast. The author served as a navigator in the RAF and flew with the Phantom from Germany, also serving in Conversion training units, and commanded the Falklands Phantom detachment. 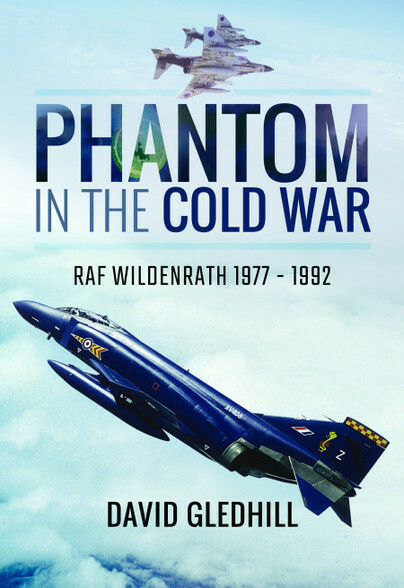 The text provides a detailed view of Phantom operations during the Cold War and is supported by a great many photographs through the body of the book, including some stunning full colour images – Most Highly Recommended. This is by far, the very best book I have read with regard to Cold War Air operations. It is also one of the best books I have read about the superb Phantom. I cannot recommend this book too highly; it is quite superb in every respect. The author really does immerse you in everyday operations on RAF Wildenrath both from the aircrew perspective and also from the ground support view. It really paints a vivid picture of life on a front-line RAF station during this tense period of history. A superbly written and very gripping read. David Gledhill joined the Royal Air Force as a Navigator in 1973. After training, he flew the F4 Phantom on squadrons in the UK and West Germany. He was one of the first aircrew members to fly the F2 and F3 Air Defence Variant of the Tornado on its acceptance into service and served for many years as an instructor on the Operational Conversion Units of both the Phantom and the Tornado. He commanded the Tornado Fighter Flight in the Falkland Islands and has worked extensively with the Armed Forces of most NATO nations. He has published a number of factual books on aviation topics and novels in the Phantom Air Combat series set during the Cold War.